UNITED NATIONS, September 1 -- The United States, which is required to allow entry by diplomats from countries like Iran, Cuba and Belarus to attend the United Nations in New York, requires these diplomats to register and seek permission to travel more than 25 miles from Columbus Circle in Manhattan. Inner City Press: It’s come to my attention that there are UN staff members from countries that are on United States sanctions lists that, whereas diplomats from these countries are precluded from travelling beyond 25 miles outside of New York without getting permission of the State Department, that there are UN staff members that, although they are international civil servants, are similarly being required to check with the State Department to travel beyond 25 miles. I think that there are Under-Secretaries-General aware of their staff members in this situation. I wanted to know whether the Secretariat believes it’s appropriate that UN staff members who are international civil servants, not working for their underlying Government, are subject to this restriction. Why hasn’t the Secretariat fought for the rights of its staff members right here in the United States? Spokesperson Nesirky: Where you’re sitting now is not in the United States, Matthew. Spokesperson Nesirky: No, I heard what you said, but I need to find out. I don’t have anything for you on that. But thanks for the question and we’ll look into it. Inner City Press asked the question because it was aware of situations in which UN Under Secretaries General threw up their hands and said nothing could or would be done. "The United Nations Secretariat has indicated to the United States Government its position of principle concerning the treatment of its staff solely on the basis of their nationality and has requested that all travel restrictions be removed by the host country as soon as possible." On September 1, Inner City Press asked when it was that the UN “indicated to the U.S. government its position of principle.” No answer was given -- some assume because the UN only belatedly raised the issue to the U.S. government AFTER the question was raised. Watch this site. UNITED NATIONS, August 31 -- The whistleblower who exposed irregularities in the UN Development Program's programs in North Korea, only to be fired and barred from UN premises, today won a $166,000 judgment from the UN Dispute Tribunal. Tony Shkurtaj, whose story Inner City Press exclusively covered from his first blowing of the whistle after UNDP ignored his complaints to then Administrator Kemal Dervis and Spokesman David Morrison's use of mainstream media to smear Shkurtaj's character and educational background, has doggedly pursued his rights as a whistleblower, first through the UN's seemingly powerless Ethics Office and now through the UN Dispute Tribunal. Earlier, UNDP refused to abide by the UN Ethics Office ruling that Shkurtaj's due process rights were violated. Now the new UN justice system, that Secretary General Ban Ki-moon has bragged so much about, has vindicated Shkurtaj's rights. 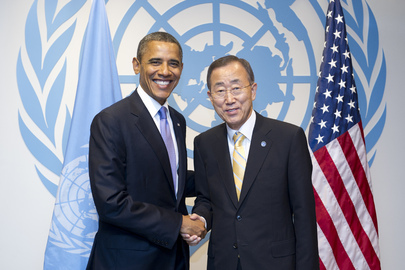 Will Ban allow UNDP under Helen Clark to continue to thumb its nose at whistleblower's rights? Watch this site. Footnote: Even earlier this month, UNDP dodged questions on fraud by its highest representative to the Palestinian people, exposed by Inner City Press, click here. 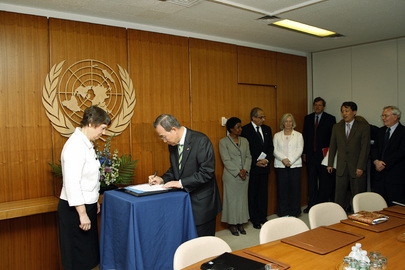 Until now, Ban Ki-moon has done nothing to reign in UNDP's Helen Clark, whose advice has gotten Ban into more and more trouble. What will happen here?